I’ve been in a sci-fi mood lately. I’ve been watching James Cameron’s Story of Science Fiction and though today’s film isn’t discussed on the show—gotta make room for films that matter like I Am Legend and Avatar—it got me thinking about the great sci-fi films I have yet to see. 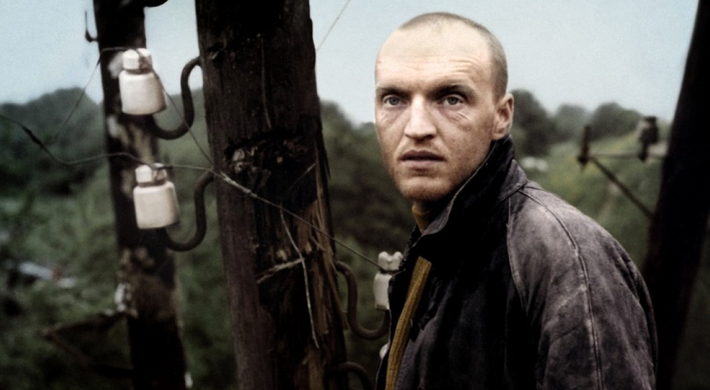 Stalker is a film you’ll find on most “Best Sci-Fi Films” lists. But you know another film on most lists? Solaris, also directed by Andrei Tarkovsky. I bring that up because Solaris is one of the most boring films I’ve ever attempted to watch. 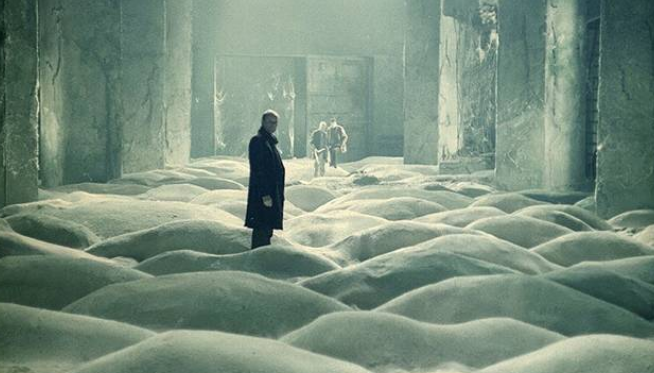 Solaris aside, I was drawn to Stalker because of its simple yet engaging premise. I hate going through blocks of plot synopsis so I’ll try to be brief. As we learn in crawling text that opens the film, in the future an asteroid hits Earth. This area is dubbed the “Zone” and is said to be a place where the normal laws of reality need not apply. Example: the Zone rearranges its terrain constantly making it nearly impossible to navigate. Even more fascinating is the legend that there is a place called the “Room” in the Zone that will grant the wishes of anyone who enters it. Needless to say many go searching for the Room to never return. Alexander Kaidanovsky plays a man known as a “Stalker” who believes he can guide people through the Zone and find the Room. The Stalker also claims there are unseen traps within the Zone and that to deviate from his path would result in death. His wife (Alisa Freinflich) begs him not to go on another excursion into the Zone, as the Stalker has spent years apart from his family in prison. Not to mention the Stalker’s daughter was born without legs, which the Stalker’s wife blames on trips to the Zone, but the Stalker goes anyways. On this trip to the Zone, the Stalker takes a man known as the Writer (Anatoli Solonitsyn) and the Professor (Nikolai Grinko) to the Zone. The Writer seeks inspiration he believes he can find in the Zone and the Professor wants to win the Nobel Prize for research he could do in the Zone. What do these men actually want from the Room? I’d hate to spoil that. I forgot to mention all of these people live in the rusted remains of a post-apocalyptic city. Much of the film was shot near abandoned factories and power plants. Though this film is pre-Chernobyl you can’t help but take away an anti-nuclear vibe from this film. Also, an anti-authoritarian vibe as armed men patrol the city. What I love is all of the sequences outside the Zone are shot in sepia tone. It almost looks like old wartime or holocaust photos. In the Zone, the film switches to full color and it is beautiful despite all of the decaying remains. 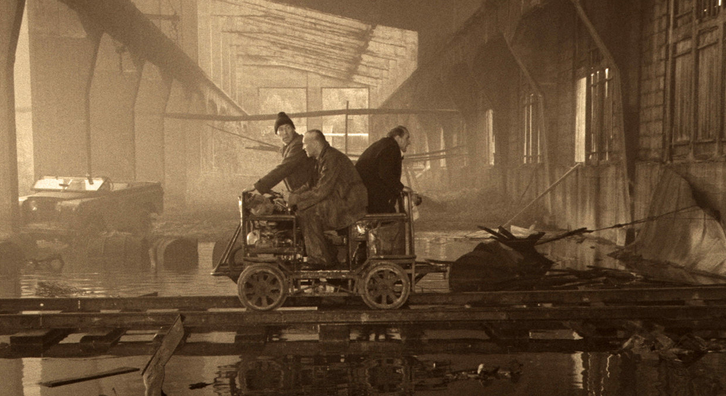 Andrei Tarkovsky also served as the film’s art director and lingers on every shot with exact precision. “Lingering” is a hallmark of Tarkovsky’s style that both hurts and elevates this film. In one scene, we have the three men sneaking through the ruins of their city trying to avoid being shot down by soldiers. They make their way to rail car and must limp along a stretch of track in one unbroken shot. Staying on this single shot builds a great deal of tension as at any moment these men could be picked off on their slow-moving vehicle. Then there are scenes where Tarkovsky will spend five minutes panning across a shot and then panning back at a snail’s pace for seemingly no reason. Tarkovsky is a self-indulgent filmmaker. There’s no reason this film needs to be over 160 minutes long. There are only 142 shots in this movie and Tarkovsky acts like every single one is the Mona Lisa. There are a lot of beautiful shots in this film—the understatement of the century—but if this film were even twenty minutes shorter the message would only be stronger. Instead, Stalker wallows in art-house pretension on occasion. That aside what I find most memorable about Stalker are the thoughts and ideas it leaves you with. The story itself is simple but the deeper implications of what the Room is and what it represents could keep film scholars wide awake at night. I don’t want to spoil it but I will say we never fully understand the potential of the Room. Is the potential to fulfill all one’s desires a curse or a blessing? Even with these characters living in the post-apocalypse its hard to say. It’s difficult to talk about this film without being enigmatic so I’ll wrap it up. Stalker isn’t an easy watch. It is long and it is slow. What makes it worth your time is it presents the viewer with a unique atmospheric world on camera, it has simple yet bold concepts and approaches all of this with a human touch. The three men in Stalker constantly discuss the good and bad of their daily lives, the potential of the Room, and the desires of man. I mean, it’s no Avatar or I Am Legend, but it’s something.